News organizations tell stories online in ways that bring together the best of traditional and digital journalism, whether that involves long-form investigative features, compelling photo slideshows or interactive maps and charts that add new levels of engagement to the day's news. To help connect you to the best works of news publishers, Google News is introducing a new section in the right-hand column of the U.S. edition. The section is called "Editors' Picks,” and it displays original content that publishers have selected as highlights from their publications. This is the latest addition to recent improvements we’ve made to the variety and presence of stories and multimedia on Google News. An array of news organizations, including local, national and niche publishers, are now using Editors’ Picks to display their best, most engaging content. Because Google News relies on algorithms, Editors' Picks will always be just that—picks provided by publishers themselves, and not by Google. 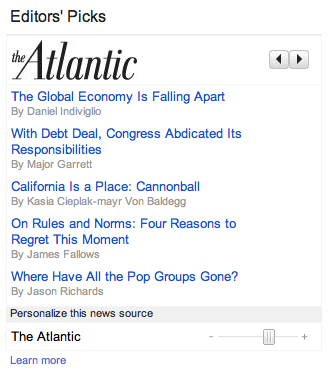 You can browse a set of publisher feeds that span national, specific and local interests—like The Atlantic, The Wall Street Journal, ProPublica, the Guardian and The Root, among many others—via the side-to-side arrows next to each publisher's logo. The feeds you see are chosen based on a variety of factors, including your news preferences. If you’re interested in using source preferences on Google News, Editors' Picks helps you do that with the slider that appears just below the articles. You may have first noticed Editors’ Picks as an experiment last year. Based on the data from that experiment, we have been working with nearly two dozen publishers in recent months and have seen a positive response from readers and publishers alike: readers get the news they're interested in from the sources they trust, and publishers receive higher traffic to their websites. We encourage any news organizations that are interested to visit our Help Center to get started.